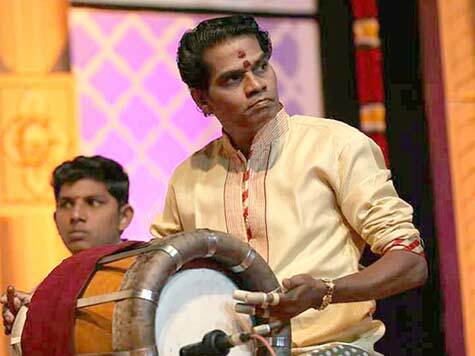 Śri Mannargudi R. Vasudevan (also addressed as Mannargudi Vasu) is one of the most sought-after percussionists due to his stunning speed of finger movements and his ability to create extraordinary rhythmic patterns and polyrhythms arising from each finger. He has championed the cause of the tavil drum as a stand-alone rhythm instrument in addition to playing as accompanist with other instrumentalists, such as those playing the double reed wind instrument known as nādaswara. Mannargudi Vasu was born to nādaswara maestro M.S. Ramakrishna Pillai and R. Amaravati in 1961, and hails from the Thiruvaur district of Tamil Nadu, India. As a highly sought-after musician, he has performed concerts in countries such as USA, UK, Canada, Malaysia, Singapore, Sri Lanka, and nearly every state in India. His early training consisted of three years at Valivalam Music School as well as completing his traditional gurukulam training (curriculum) at the residence of Keevalur Sriman Kunju Singarevelu Pillai. Serving the cause of Indic music for over four decades, Mannargudi Vasu has played in professional music performances alongside renowned nādaswara and tavil maestros. He is the recipient of many awards merited by his sheer dedication to his music profession and astounding performances. A few of the notable accolades are: Kanchikamakoti Asthana Vidwan, conferred by the renowned maṭha of Adi-Śankara in Kanchipuram, India; Kalaimamani by the Government of Tamil Nadu in 1992. Other honourary titles awarded to Mannargudi Vasudevan include: Bala Nadeswara llam Sunderoli, Thavil Isai llam Chakravarty (Lions Club, Chennai), Thavil Isai Mamurasu (Thamilisai Mandram, Thiruvaiyaru), Jana Ranjaka Thavil Chakravarthi (Trichy Isai Sangam). The instrument used by maestro Vasudevan is also called tavil, or thavil, which is the Tamil word denoting the brilliant sound that emanates from this particular type of mardala, and is attributed to its construction using a hollowed cylindrical piece of jackfruit wood. Layers of animal skin are stretched across the two sides of the nearly spherical shell using hemp hoops. One face of the instrument typically has a larger diameter than the other side. The larger drumhead is stretched tightly, while the smaller drumhead is kept somewhat loose to allow adjustments of the pitch. The larger face is higher in pitch than the smaller face. The smaller side is played with a short thick stick made from the wood of the portia tree (Thespesia populnea). The larger side is played with hand, wrist and fingers covered with open-ended metal thimbles to bring about a sharp sound. This indigenous musical instrument is said to hail from the ancient city of Tanjavur in Tamil Nadu, India. An integral part of the karnatic music, tavil is a regular part of traditional festivals and temple ceremonies. Vasu, as is he is lovingly called, has been known in the inner circles of Karnatic classical music and Vedic temple music as a stunning drummer of speed, dexterity and complexity of rhythms. His Holiness Swami Vidyadhishananda, the head monk of Hansavedas Maṭha and founding monk of Self Enquiry Life Fellowship, requested Vasu to recreate the Vedic rhythmic mystique using the tavil, borrowing his inspiration from the hallowed past of mardala drums. This specially composed meditative music was inspired by the traditional repertoire of Vedic rhythms attributed to Lord Natarāja Shiva and is part of the preservation project undertaken by the nonprofit organization Self Enquiry Life Fellowship to record and archive meditative Vedic music and chants.